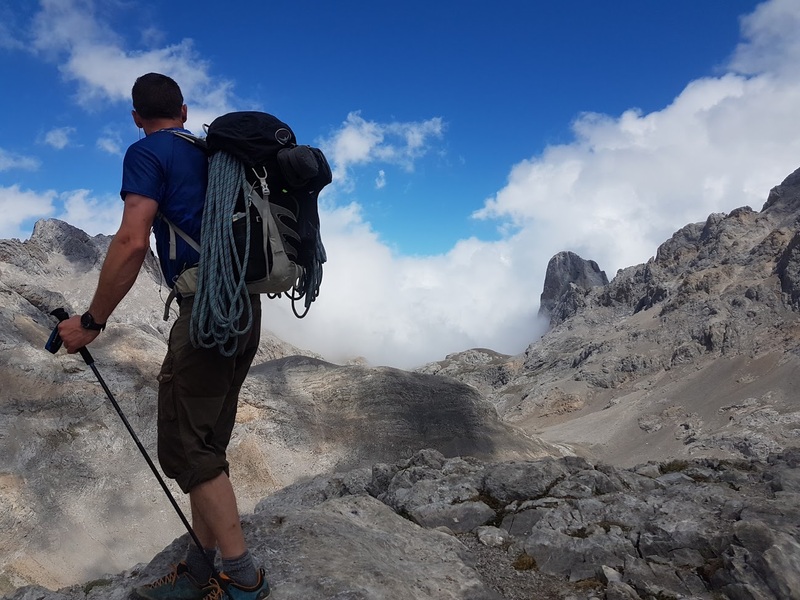 Our climb of the most coveted peak of the Picos de Europa started with a breakfast negotiation at 6am with the stoic Spanish cook in the Refugio de Urriellu. 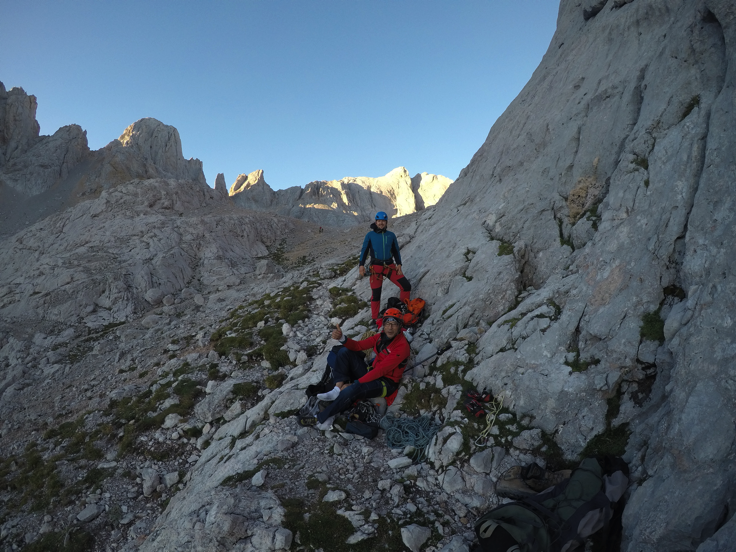 Early starts are not the norm in the Spanish mountains apparently) After eating our hard won basket of cake and rich tea biscuits we set off just before dawn, heading for the South face and a 14 pitch route called La Cepeda. 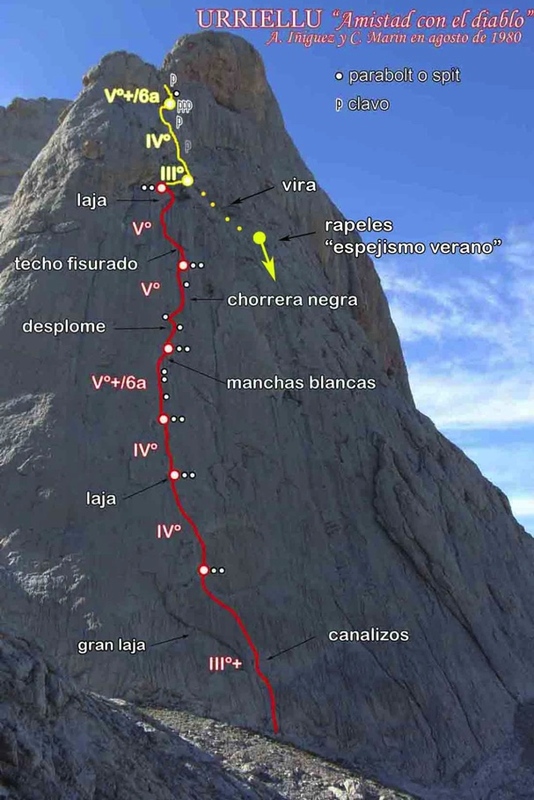 The 5 hour approach from Fuente De. Peter looking towards our goal. As it turned out, La Cepeda was a popular one – 2 people were already on it and 4 or 5 others were waiting at the bottom. 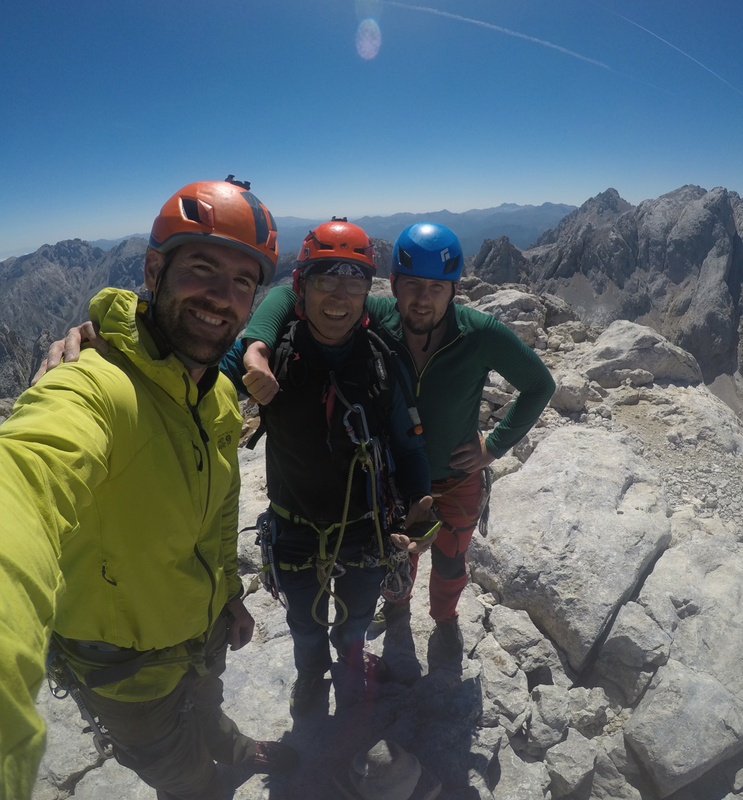 The night before we had made friends with a solo Spanish climber called Fernando – and again we met him at the base of the East face where he asked if he could join up with us and we agreed. Even though our Spanish was terrible (unless we needed to order beer) and Fernando’s English wasn’t much better, we somehow managed to communicate reasonably well. 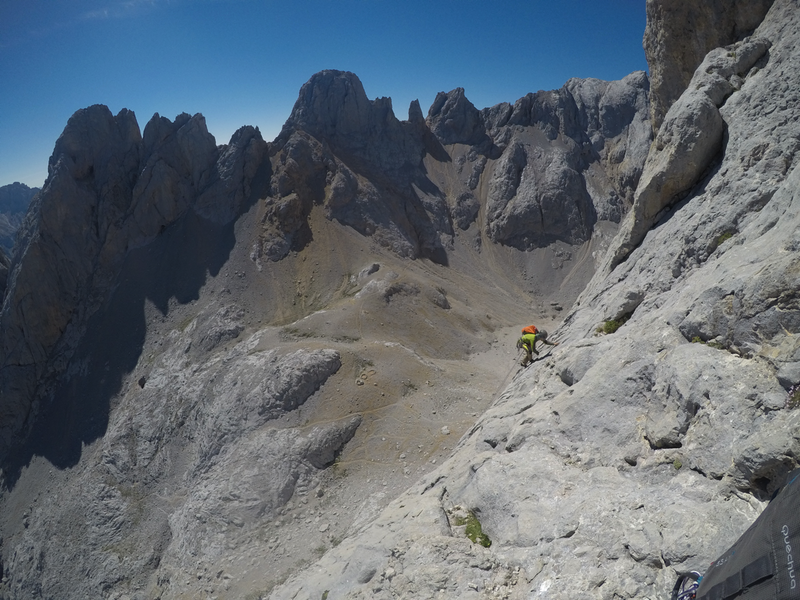 So we decided to climb a route called Amistad Con El Diablo – slightly harder than, but ultimately joining up with, Cepeda towards the top. Interestingly the name translates as “friendship with the Devil”…. I jumped straight on P1 which was a nice easy pitch to start. Although I did climb past the belay and belayed Michael and Fernando off a spike instead. Fernando raced up the slightly harder P2 with ease. So far so good- the rock was beautiful and the sun was on its way around the corner to warm us. 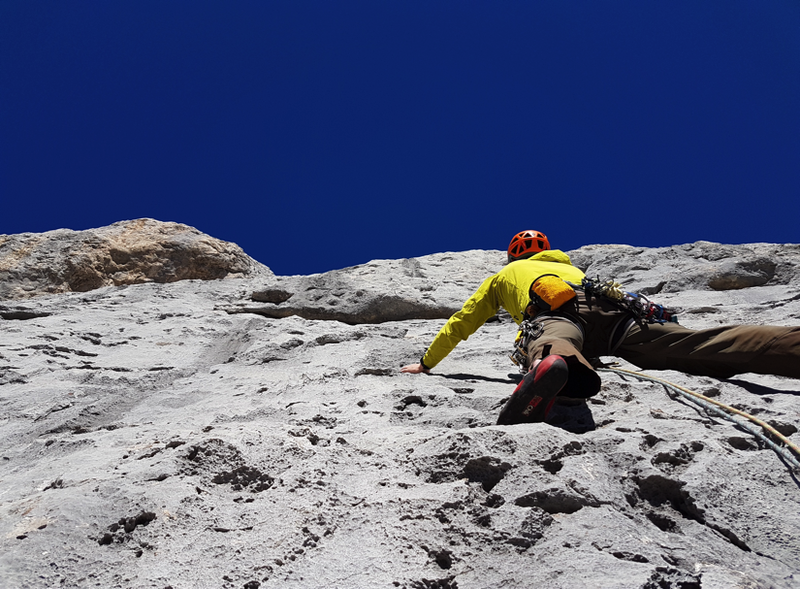 P4 was going to be the hardest pitch on the route (until the 6a overhang portion after we join La Cepeda, which it turns out was bolted well). The grading was V+/ 6a – a sort of mixture of trad with an odd bolt at hard portions which were impossible to protect. E1 seemed appropriate for us Irish climbers. It being my turn to lead, I set off from the belay and the climbing got progressively harder until I reached the crux. I was on my limit and slipped on the slightly polished footholds a couple of times and only just managed to stay on! 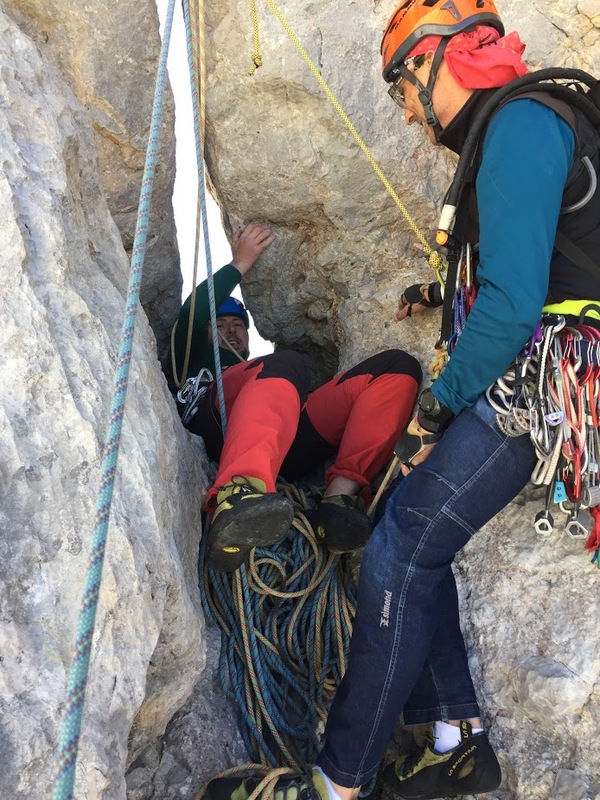 There were 3 bolts for 30m of climbing and not many options for trad gear…After quite a bit of faffing, procrastination and little motivational chats with myself, I was relieved to reach the next belay and had developed a new level of respect for Spanish climbers. Up came Fernando with ease, followed by Michael – whom I was glad to see struggled a little at the crux! Fernando sped off again, making easy work of P5, which was not quite as hard the previous one, but sustained and run out climbing nonetheless. When we were all safely at the next belay Michael decided he wasn’t in the mood for anymore scary leads, so it was my turn again. Now we would join Cepeda. Michael had gotten his mojo back at this stage and was up for a lead. P7 turned out to be a beautiful climb with lots of bridging and uncharacteristically there was gear on demand. Michael and I were soon climbing and I was pleased to climb the crux cleanly, although it would have been a difficult lead. Kudos to Fernando, our favorite Spaniard. 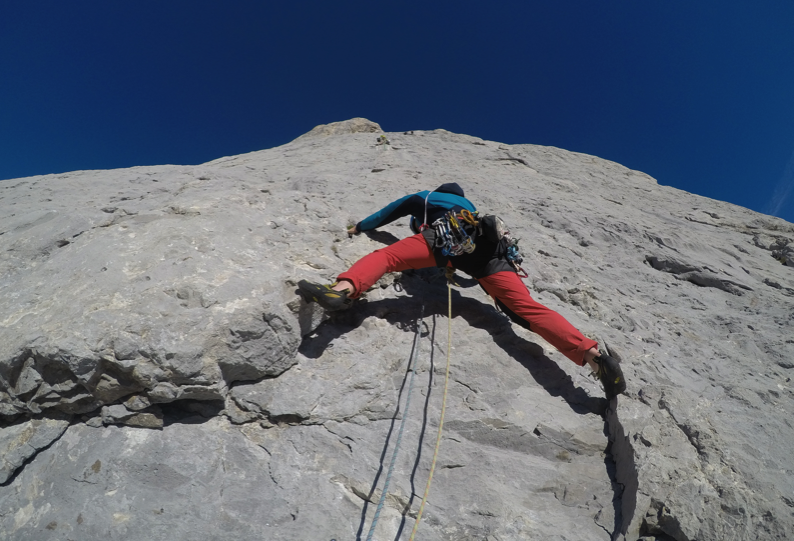 The decent consisted of multiple abseils down the now quiet South face direct route. Soon we were back at the Refugio de Urriellu for celebration beers, just in time to see the dreaded mist approach from the valley.